It’s clear that things were getting heated at The Theater at Madison Square Garden on Thursday when Michael Bisping was forced to be the voice of reason. But that was the case when UFC 217 co-main eventers Cody Garbrandt and TJ Dillashaw began jawing with each other during the final press conference for Saturday’s bout at MSG. “Relax, calm the #$%$ down,” said the UFC middleweight champion, who was in good spirits, taking jabs at everyone from Garbrandt and the media to welterweight contender Jorge Masvidal and the fans in attendance. As for his opponent, former welterweight champion Georges St-Pierre, Bisping even tried to get the press to ask the Canadian more questions. It’s been a common theme throughout the lead-up to Saturday’s headliner, that St-Pierre will be looking for a takedown early and often once the Octagon door closes. 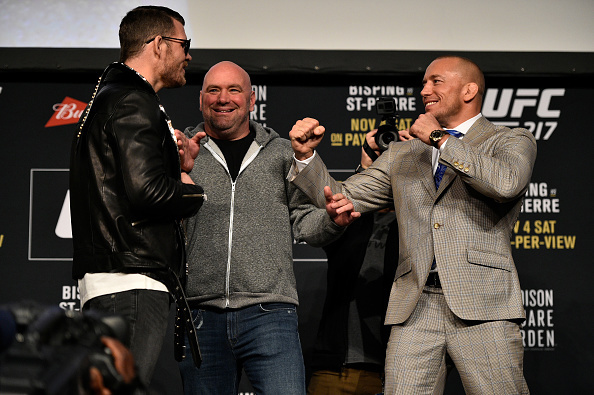 “Jab, jab, double leg all day,” said Bisping of the strategy he expects from the challenger. But the Brit also revealed his solution to such a game plan. St-Pierre, 36, kept smiling, taking in the atmosphere before his first fight since 2013. Bisping, 38, can’t wait either, as he expects that following up wins over Anderson Silva, Luke Rockhold and Dan Henderson with a victory over St-Pierre will solidify his legacy. GSP didn’t blink, continuing to grin at his foe, who made sure he got the last jab in.